I have been planning to up cycle some of my shoes and clothing for months now. Things that I have had a long time and never worn, clothes I have brought that are too big/small for me not sure what to do with them. Most of my unwanted used clothes I give to charity but unworn shoes that are the wrong colour or a little boring and clothes that I brought new and are too small or too big for me and never got taken back to the shop are all mixed in my wardrobe never to be shown daylight again. Not now, new year and new me! Things I plan to do that never gets done, DO! Up cycle things to make something new and fun from items you will never wear! Ever thing I use to up cycle these shoes, I had in to!! Result new sparkly polka dot fun shoes at no cost!! These shoes I purchased years ago in the sale but the pale green colour never really went with anything I wore and the front to the toes looked such a long way down. I know Where I'd Rather Be!! "Wordless Wednesday Blog Hop : Up-cycled…"
"What I Wore : First Of The Sale Bargains…"
How cute! Hope you get that date night soon! I think that they came out nice and have fun with your new shoes! Lol! Love these shoes… not sure I could ever achieve the same result, but I would love it someone did a pair for me…. ;)) I'd love it if you came and linked this post up to our new #AllAboutYou Link & Pin Party over on Mother.Wife.Me – I have co-hosts in Mama and More and City Girl At Heart. The Party is every Tuesday, but for our first week, we're keeping the linky open all week long, by way of a celebration! LOVE to upcycle! Check me out at re-creations.biz. I will definitely visit your link party on Monday! Hmmm, up-cycling your clothing & shoes…now, that's an interesting idea. You clever, clever girl! Happy WW & 2014, my friend! 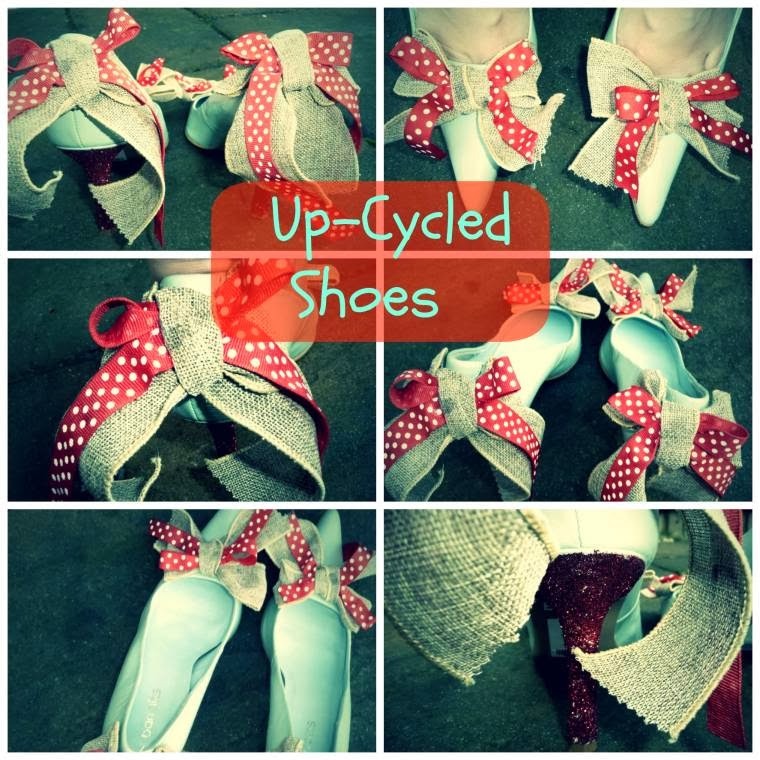 Cute, I do upcycle things but I have never tried upcyling my own shoes. How fun! Thank you so much for helping to make the Thursday Favorite Things blog hop so much fun Hugs! Crafts are just not my strong suit. But those do look great! I don't think I could wear a heel that high though. Thank you for joining the Thumping Thursday bloghop. Really cute and creative! Thanks for sharing it on the blog hop! have a great weekend!